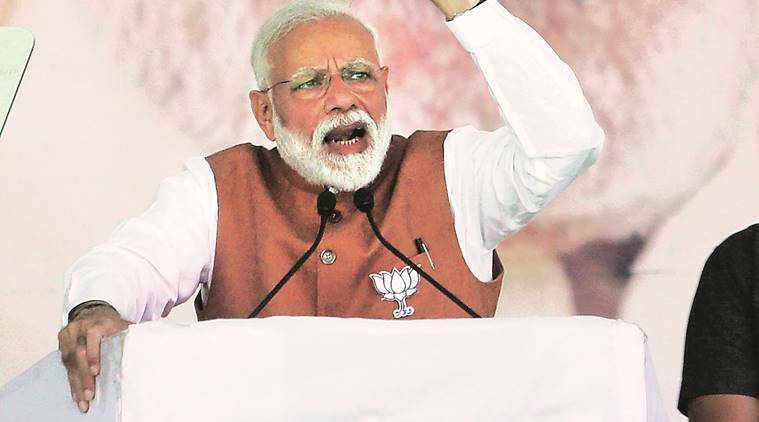 Claiming Opposition parties are competing to “become heroes in Pakistan” where they are “getting great media coverage” and “applause”, Prime Minister Narendra Modi Thursday said “terrorists and their supporters across the border are today praying they somehow get rid of the chowkidar and the mahamilawati (he calls the Opposition impure) come to power in Delhi”. Slamming the Congress for its remarks post the Balakot air strike, he said: “I am surprised… what has happened to it? Is it the same Congress whose leader Vallabhbhai Patel left no stone unturned for the unity and integrity of India and Netaji Subhash Chandra Bose gave the slogan of Azad Hindustan?” He said Congress leaders, in their hatred for Modi, had stopped looking at national interest.